Wouldn’t it be great if there was a magic potion you could drink, a stunt you could perform or even a test you could take that would automagically take you from obscurity to popularity in one painless step? Wouldn’t it be even better if someone would just hand you the keys to the perfect Writer Platform and you could just hop in, rev the engine and race off to Author Superstardom? The shortcut? Seek the advice and perspectives of those who have already successfully navigated the near impossible. 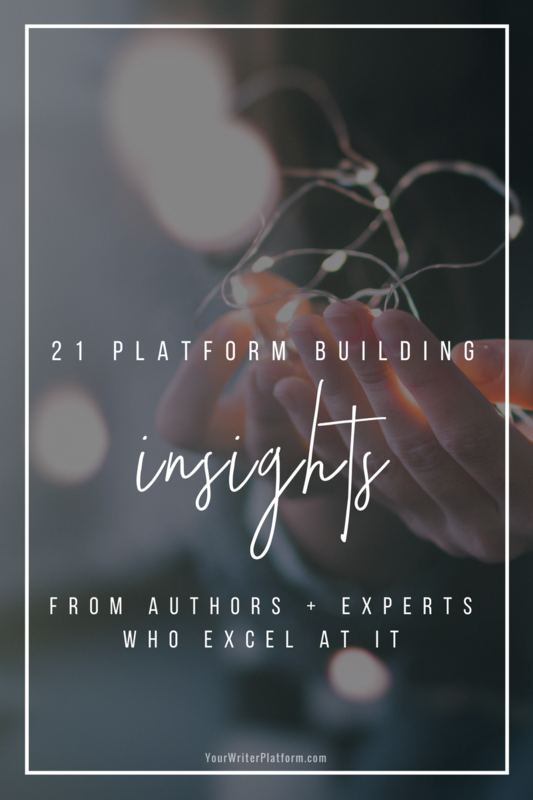 The following is some of the most useful and insightful advice to be had from authors and experts who have built thriving platforms – and lived to tell about it. And yet many of us are doing just that. We’re putting our best art on pause. “If this is you, if you’ve chosen to believe this lie, then let me tell you the harsh truth: That day will never come. The day in which you will be discovered. “It won’t happen. Not if you’re simply waiting around. You don’t need anyone’s permission. You don’t need to audition, submit an application, or wait for approval. You are in control of your own success. The technology is easier to use than ever. Whether you want to write a blog, launch a podcast, or create your own video channel, the hardware and software make it simple to get started. The pioneers have mapped the trail. You don’t have to figure it out on your own. You can build on the experience of others. The cost is minimal. In most cases, you can get started for free or for a few dollars a month. The biggest investment will be your time. But even then, you can maximize your efficiency with the current tools available. “…what is marketing at its heart? Engaging an audience. “Whether it’s giving us a vicarious experience or making us feel like we can change the world or simply making us laugh, we as an audience engage with stories on an emotional level and we transfer those emotions (hopefully positive) to the product being advertised. No one else has lived your life, had your experiences, or seen the world through your eyes. What can you share from your unique story that will help you attract your audience? Consider applying some of the advice suggested by the authors and experts above to your own marketing strategy. Start now, share freely and focus on consciously and creatively building a connection with people who ‘get’ you. Do you agree with the advice and insights above? Do you have your own platform building wisdom to share? Help your fellow writers by sharing your advice below. Glad to hear it, Brian! Hopefully this article gave you some great ideas for building your platform! Kimberley, this is such a wonderful resource! Building a platform can be a really daunting thing, but the expert advice you’ve compiled here really clarifies the process. It is daunting, I agree Bobbi! Even the experts differ somewhat on the ‘execution’ of building an author platform (although they all seem to agree on the need for one). Bite sized chunks is probably the best way to approach it. Taking it one step at a time will get you there! Thanks for your comments, Lori! Corbett’s quote is great; I also like Jeff Goins’ comment, “Nobody who changed the world did it by waiting for an audience.” So right! 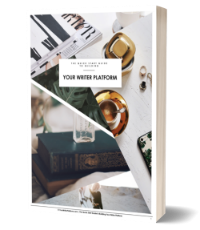 What a great resource for building an author platform. I’m a beginner so I’m signing up to learn how to build a following before the book deal. Glad you found it helpful, Priska! Keep at it, and soon you’ll have an engaged fan base that can’t wait for your next book! Actually I’m pretty glad that said magic potion doesn’t exist. Otherwise 1) I’d be exposed to a lot more crap and 2) I’d be shoving my crap down other people’s throats. That is, I think the process from obscurity to popularity is what builds quality. Which seems what a few of the folks you quoted seem to be saying themselves. This is my favorite kind of list post, Kimberly. A great resource that can be gone back to time after time. I keep a special folder in Evernote for these… and this one is now saved to it! Creating a platform/audience building is a fascination of mine… and can be very frustrating in the early stages. Your blog looks really sharp! Ahh, Evernote. One of my new favourite things! Glad you found the article useful, Gary! And you’re right, it can be frustrating and overwhelming at first. But the best thing to realize is that there are many creative (and I agree, fascinating) ways to build your audience–as we can see from the varied advice above. Thanks for the site appreciation as well! Thank you so much for putting all of these great insights in one place. I am cranking out my first Kindle book now. It’s a huge learning experience. I hope I’m doing some things right, but feel like the ball is just barely starting to roll. I hope to leverage all I learn in Round 1 to make Round 2 much more effective. I think that’s the best way to go at it, Joe. Learn as you go, but know that everybody makes a few mistakes along the way. Remember, too, that all the work you put in now will help build momentum for years to come. Good luck on your kindle book! Send me an email and let me know how it goes! Unfortunately, I’m going about this backwards – Two books in and now I’m thinking marketing. Terrific advice which I’m starting to follow one bit at a time. Thanks so much – Just followed via twitter. Thank you for this fabulously helpful resource, Kimberley! Just a few weeks ago, I hadn’t even heard of most of these folks. Now that I’m paying attention, it’s amazing to see how much they’ve done by just going for it. Exactly, Nikki! I don’t believe you can create in a vacuum. Great ideas spring from the great ideas of others. Learn from those people who have already carved out a path and add your ‘special sauce’ to create something that is uniquely Nikki. Some good advice, Karen! It is easy to get overwhelmed when first starting out, but each “plank” you add to your platform helps strengthen your connection with your present and future audience. Starting is always the hardest part, but simple, direct steps toward your goal will get you there! Kimberley, I commend you for having your writer platform website. Thanks to Jeff Goins for retweeting this impressive collection of established bloggers and their views on platform building, I now know about your website. With the Barnes & Noble gift certificate my daughter gave me for Christmas I bought Get Known Before the Book Deal by Christina Katz, Platform: Get Noticed in a Noisy World by Michael Hyatt, and Create Your Writer Platform by Chuck Sambuchino. I have been around (age 70) long enough to remember when the word we heard all the time at writing workshops and conferences was “voice.” Also long enough to have used onion skin paper for carbon copies of our manuscripts. Thank you for what you are doing to help writers. Thank you so much, Barbara! I appreciate it, and I’m grateful to Jeff for helping to share this information so that writers can help writers succeed. I hope that the Your Writer Platform community or “Tribe” grows as strong as Jeff’s at GoinsWriter.com! I love the three books you’ve mentioned, and will be adding them to the resource page. What did you think of them? Did you have a favourite? That is the best part, isn’t Barbara? There is not just one way, but many creative and interesting paths to connecting with our readers. Thanks for your comments! Always respond to comments on your blog. I think that needs to be done before you even make a new post. Also, comment on other people’s blogs. A comment takes a blog post from being a static, handbill-type object to a conversation. And it’s not just a conversation between you and one other person, but it’s a conversation made in a public room where anyone can overhear and also come into the conversation. Thanks for your great comment, Keri! I’m with you on the importance of responding to comments on your own site, as well as contributing to the conversation on other blogs. I believe comments are a barometer of the level of engagement your site elicits from your readers. The greater the interaction, the greater the impact. By allowing comments on your blog, you can put a face and a voice to your reader, and even know what they are thinking the moment they’ve read your post. From a marketing/business perspective, that’s gold! From a personal perspective, it gives me goose bumps to be able to connect with like-minded people from literally any where in the world! I have been researching advice all day on how to improve my blog. I could have saved myself a lot of time. Thank you so much. Now I can work solely on finding something to write about and getting people to follow it.